- Adjustable Rating:+/-15% output voltage . 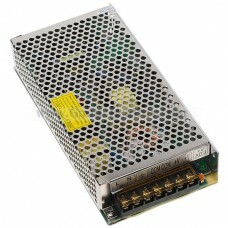 - Lower Power consumption, Lower Temperature, high efficiency . - Short circuit/Over load/ Over voltage/ Over temp protection. - Design with Built-in EMI Filter, improve signal precision . - Output power: 12V 10A . - LED indicator for power on. - Size: 193 x 99 x 42(mm) . Suitable for CCTV, Radio, Camera, Computer project.